If you need a creative boost, a little inspiration, a bit of help studying, or just a way to focus on the things that are really important: use STABILO highlighters with the special Anti-Dry-Out technology for 100% concentrated work! 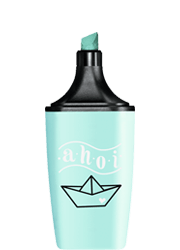 Anything but dull – five cool colors come in trendy tube design, which makes them fun to use and easy to hold. 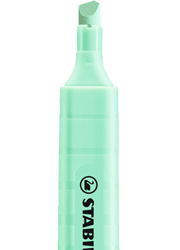 These pocket-sized highlighters in 6 subtle, trendy pastel colors are available for a limited time only. New, fashionable colors will give your work a subtle but stylish look. 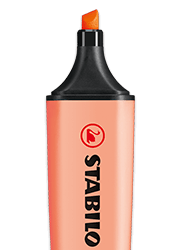 Small, but strong: the STABILO BOSS MINI Pastellove is a stylish must-have for color-loving creatives. Pastel tones are undoubtedly one of the major fashion trends. Pink, lilac, light blue and mint green are just some of the colors that are able to make any accessory more delicate. With six new beautiful colors we turned our STABILO BOSS ORIGINAL into an exciting accessory that allows you to really express yourself. How did the STABILO BOSS get its shape?How did the STABILO BOSS get its shape? 40 years later, the flat, chubby highlighter still has many imitators. And to this day it remains the highlight of an entire product category. Why is the cap of the STABILO BOSS ORIGINAL black and does not match the ink color?Why is the cap of the STABILO BOSS ORIGINAL black and does not match the ink color? 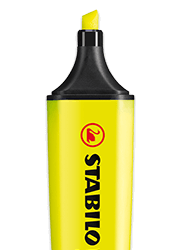 STABILO BOSS ORIGINAL has been a very successful product for more than 40 years. One factor of its success is its unique design. The black cap is a copyrighted design feature and therefore we intend to keep this colour concept in future. 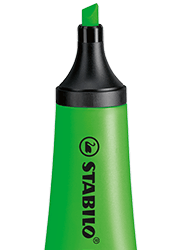 A similar STABILO product, the STABILO LUMINATOR highlighter, features a cap which matches the ink colour and has an XXL ink tank. Wha's the best way to remove stains made by highlighters?Wha's the best way to remove stains made by highlighters? If a highlighter ink stain has already completely dried, it will be difficult to do anything more than only to reduce the intensity of the stain. The key to successful stain removal is to act fast: even waiting just a few minutes after the ink stain has been made can reduce the chances of completely removing the stain. The type of fibres and their pre-treatment will also have a major influence. After all, the colourants in the highlighter inks are textile dyes that were developed for good fibre adsorption. The ink is an emulsion ink (similar to wall paint) which, once dried, is no longer water-soluble because the plastic emulsion then cross-links. With a fresh highlighter ink stain, it is important to remove the excess ink which has not yet been absorbed into the fibres while it is still moist. This is done by putting a piece of dry, absorbent fleece on the stain and using a damp piece of fleece applied to the rear side of the material to press the ink out of it and into the dry fleece. The dry fleece immediately absorbs and wicks away the excess ink, which prevents the stain from spreading further. When no more ink can be pressed into the dry fleece using this method, only the ink which has already soaked into the fibres will be left. It is important that the material is then washed immediately. Some customers report treating the material with ox-gall soap before washing it, with significantly improved results.